Students in their second year at CSUMB are eligible for the suites on main campus. The Vineyard or Pinnacles Suites in the North Quad offer single or double occupancy rooms in either a two bedroom, one bath or a four bedroom, two bath configuration. These four-story suites are within walking distance of the main quad, classrooms, the library, the Dining Commons, computer facilities, the Media Learning Complex, the Campus Health Center, the Otter Sports Center, and all administrative offices. A Health and Wellness program is hosted on the fourth floor of the Vineyard Suites. All students wanting to live in either the Vineyard or Pinnacles Suites in the North Quad must be matriculated CSU Monterey Bay students working toward a degree. Students must also be enrolled full time each semester they reside on-campus. This means 12 units per semester for undergraduates and at least 8 units per semester for graduate students. 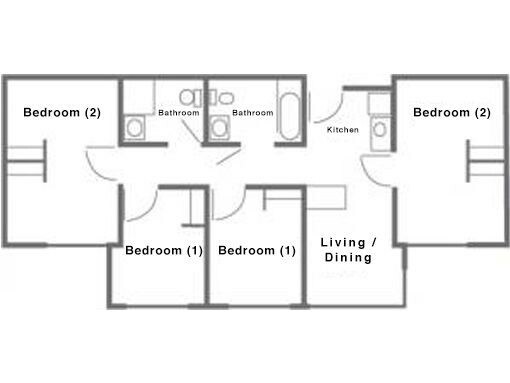 4 bedroom, 6 person suite floorplan. Measurements are approximate and actual room layouts may vary. Students in their second year are eligible for assignment in the Strawberry Apartments. The Strawberry Apartments, located in North Quad, offer single occupancy rooms in either a two bedroom, one bath or a four bedroom, two bath apartment configuration. These four-story apartments are within walking distance of the main quad, classrooms, the library, the Dining Commons, computer facilities, the Media Learning Complex, the Campus Health Center, the Otter Sports Facilities, and all administrative offices. All students wanting to live in the Strawberry Apartments must be matriculated CSU Monterey Bay students working toward a degree. Students must also be enrolled full time each semester they reside on-campus. This means 12 units per semester for undergraduates and at least 8 units per semester for graduate students. Sample floor plan for a two bedroom 2 person apartment. Actual room layouts may vary. Sample floor plan for a four bedroom 4 person apartment. Actual room layouts may vary.